Inventory We are a resale marketplace, not a box office or venue. Ticket prices may exceed face value. This site is not owned by PNC Pavilion . PNC Pavilion at Riverbend Music Center is the smaller of the two venues that caters to much of the summertime concert series for the Cincinnati metro area. Riverbend Music Center is an outdoor amphitheater, with a seating capacity of 20,500, located in Cincinnati, Ohio, along the banks of the Ohio River. Riverbend was originally built for the Cincinnati Symphony Orchestra to allow them to play in an outdoor venue during the summer months. The venue's first performance was by Erich Kunzel & The Cincinnati Pops Orchestra, with special guests Ella Fitzgerald and Neil Armstrong in 1984. When Riverbend opened in 1984, it was one of only 16 outdoor music amphitheaters in the United States and it helped revive the Cincinnati concert scene. 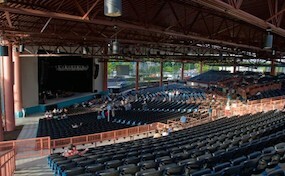 Riverbend has since built an additional 4,100 seat pavilion, The National City Pavilion, adjacent to the current box office. The pavilion opened on May 24, 2008 with Cincinnati's Over the Rhine. In January 2009 National City Pavilion became PNC Pavilion due to PNC's purchase of National City bank. The Pops performed the first live concert televised from Cincinnati here, which aired on PBS, featuring Rosemary Clooney and Doc Severinsen. The Dave Matthews Band performed and recorded their show. Sting performed during his Symphonicities Tour, along with the Royal Philharmonic Orchestra. The amphitheatre has also played host to music festivals, including Cr�e Fest, Cr�e Fest 2, Curiosa, Lilith Fair, Lollapalooza, The Mayhem Festival, Ozzfest, Projekt Revolution and The Vans Warped Tour. Jimmy Buffett has played at Riverbend every year since 1988. There are only two other venues at which he has played more shows (Comcast Center and Merriweather Post Pavilion). PNC.PavilionCincinnati.com is not currently affiliated with any official supplier, website, or box office. We provide online access to a network of secondary market inventory at the low prices. All tickets may be above or below face value and prices can fluctuate on a hourly basis. Ordering for any PNC Pavilion events could not be easier, click on the event you wish to attend and follow the steps through checkout or call our operators at anytime.